Have you tried a Mango Scoop? Not the luscious fruit the best of which is grown in the Philippines, or the ice cream that is a fave flavor of Filipinos. Mango Scoop is what arrives in your email inbox about 3 times a week if you’re a friend, a customer, or just a watcher of bargain flights to the Philippines, Asia, and some European destinations. Mango Scoop is the attractive e-newsletter of Mango Tours, the latest of which (September 28 issue) lures you with tour packages to Thailand, a promo fare of $597 to the Philippines, and such interesting reads as hard-to-kill houseplants for frequent travelers, and technological advances in the travel industry. To interact with readers, the site asks you to share your travel stories on social media #MangoToursTakesYouThere. Mango Tours is the retail arm of TravelFast International, a travel agency acquired 40 years ago by a young, amiable Filipino immigrant named Johnny Francisco. A De La Salle University accounting graduate, Francisco was a budget system analyst for San Miguel Corp. before he decided to migrate to the US in 1976. As is the immigrant’s wont for risk-taking, it took some leap of faith to turn his back on a comfortable corporate job to the uncertainty of surviving in a different country. After dipping his hand in the freight forwarding business, Francisco saw potential in the travel business – something he initially knew nothing about, so he had to learn the ropes from scratch. Longtime friends and customers like community leader Polly Cortez and public relations specialist Lorna Dietz remember Francisco in his tiny office at the Flood Building in San Francisco’s downtown, singlehandedly booking airline tickets for balikbayans who, then as now, would insist on getting the cheapest fares available. To get his name out there, the then-one-man operator would distribute fliers himself to Filipino passersby and during Filipino gatherings. While he had to invest a lot of effort and determination to establish himself in the highly competitive travel business, Francisco’s natural amiability and patience helped him build a customer base that eventually became substantial enough to be noticed by some airlines plying the Asian routes. Thus, he learned the other aspect of the business – not only do you provide low-cost tickets to your retail customers, but you also have to build relationships with the airlines so you can be classified as a consolidator. Four decades after Francisco entered the travel business, Travelfast, through its retail arm Mango Tours (established in 2004), now operates 16 branches in the US – 7 in Northern California, 7 in Southern California, one in Las Vegas and one in Tukwila, Washington. It has a total of 45 employees in the US and 110 in the Philippines where most of its customer service calls are handled 24/7. Mango Tours deliberately focuses its marketing and services on the Filipino American market which, according to the latest census figures, is 4 million strong. Francisco estimates that his outfit owns 35 percent of the Fil-Am travel to Manila business. Breaking the numbers down further, he says the California market alone, where Filipino-owned travel agencies proliferate, gives him a 38 percent share. A large majority -- 65 percent – of its bookings is with Philippine Airlines. This lucrative relationship with the Philippines’ flag carrier has resulted in better rates for Mango Tours customers. Polly Cortez attests, if a traveler wants to take PAL, it’s better to book with Mango Tours rather than PAL itself because apparently PAL ticket agents are bound to its published rates, not consolidator rates. Indeed, Mango Tours is a familiar name among regular balikbayans from California. Some who return to Manila multiple times a year rely on the company for their ticketing needs because of the convenience Francisco offers repeat customers: a dedicated travel specialist assigned to a regular traveler, who knows the traveler’s needs and wants, and can get a good rate at a moment’s notice if need be. Those who were privy to Francisco’s early solitary service feel a sense of loyalty to the man even as they hail the evolution of the company from a paper and telephone-based operation to a fully developed online retailer whose booking site is able to hold its own with such industry giants as Expedia, Orbitz, and Priceline. A particularly hailed supplementary service that the company started a few years ago is the airport transfer service at NAIA: customers who sign up for it can be brought from and to the airport to/from various destinations in Metro Manila, with assistance when necessary. No need to bother anyone for “sundo” or “hatid.” And mercifully, no more dealing with dishonest taxis or limo drivers. Looking at reviews for Mango Tours on the web confirms that its customers are generally satisfied with the service. Although there are a smattering of critics and complaints – mainly about not getting call backs – the comments show that in the niche market of balikbayans, Mango Tours rocks. 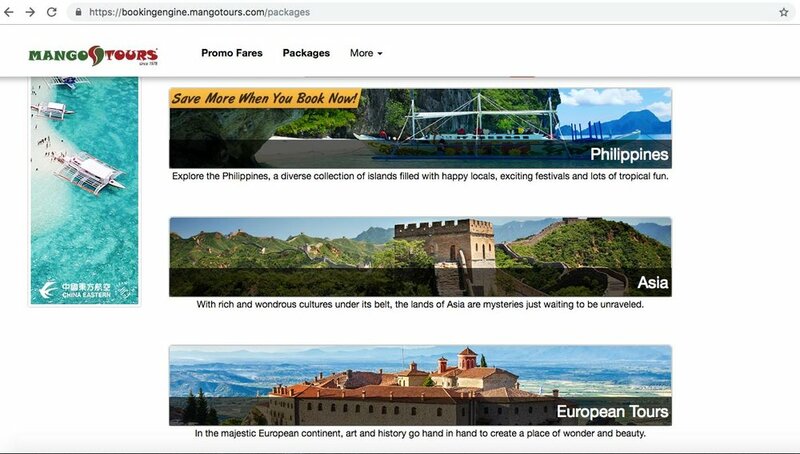 Having nailed its niche as the go-to company for travel to the Philippines, Mango Tours has started to expand its offerings to include tour packages and pilgrimages to Europe and other popular destinations. This fall, it will introduce tour and sightseeing packages to Manila and other parts of the Philippines, and to other Asian destinations. Change is the challenge and the clarion call of Mango Tours these days as it consolidates and expands its web presence through clever marketing. Mango Scoop catches attention, the constant drip of postings whets the customers’ appetite for seeing the world. The moving force behind these updated and upgraded approach to web and social media marketing is Juan “Jappy” Francisco, Johnny’s only son, who was groomed to join the family business ever since he was a kid. He officially joined the company in 2007 as marketing director and now holds the title Vice President of Operations (although he jokes that every time he orders new business cards, he changes his title). This full-throttled use of technology is indeed required of companies competing in the highly volatile, highly competitive travel arena. There’s no other way. But a technology-focused and [data] science-believing Filipino-owned operation is still a novelty in the overall Filipino American market. This is what makes Mango Tours a beacon of inspiration for aspiring entrepreneurs beyond the travel industry. This is how the company is setting the standard by which Fil-Am businesses can aspire.. When you find a good fare, buy it right away. Go with a known travel agent. Make copies of all travel documents. Make sure to contact your travel agency before your travel, just to make sure that there is a ticket attached to your reservation. Better confirm with the airline. Buy travel insurance. This is very important.